Maintaining reliable RH measurements in harsh or corrosive environments is notoriously difficult as the conditions themselves degrade the sensors and equipment, often in short time-periods. 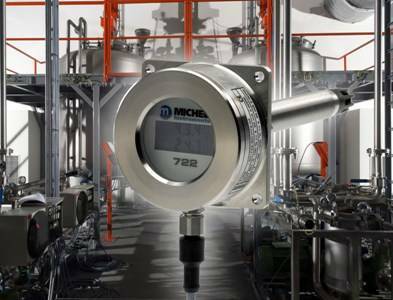 Michell Instruments’ DT722 RH and temperature transmitter provides a solution to this problem. To best meet specific application needs, the DT722 series is available in digital (DT722) and analogue (DT722-X18) models. The digital electronic platform version of the DT722 gives high performance measurement with excellent RH accuracy and delivers reliable, consistent and accurate results even over changing ambient conditions. The DT722-X18 is an analogue through path measurement device with exceptional mechanical toughness. Field adjustment is remarkably quick and easy, making it a good choice for use in all types of aftermarket service and a robust favourite with the nuclear industry. Quick and simple serviceability and high stability add to the appeal of this sturdy device. The DT722 transmitters have been designed for use in severe industrial environments. They are exceptionally reliable and robust with a strong, stainless steel housing providing protection against rough handling or accidental damage, IP65 (NEMA 4) ingress protection and a probe which can withstand temperatures up to 150°C. The transmitters are for duct mounting in the most suitable place for the application. They have excellent chemical resistance for longer use in contaminated areas and are available with a selection of filter materials to afford best protection to the sensors based on specific environmental conditions. Michell products are designed for high performance, long term stability and flexibility in application – all to provide the user with exceptional peace of mind to keep processes efficient and quality high. Reduced calibration requirements keep the cost of ownership low compared with many equivalent technologies and minimal self-heating within the instruments ensures high precision measurement and low errors due to changes in temperature. Configurable outputs and a wide range of options give the user the flexibility to get the best match for a process. Michell has a successful history of working closely with its customers to provide customised solutions where needed. Michell delivers innovative solutions that meet real-world needs and the DT722 series is truly designed to give assured, reliable performance in robust packages for the harshest of industrial environments. Michell Instruments is a pioneer of relative humidity (RH) and dew-point measurement technology with continued development programmes and over 35 years of experience. It offers a wide range of RH measurement products to best suit specific process requirements along with in-depth application support and customisation services if needed.